Heavy weight diamond design Mexican blanket. 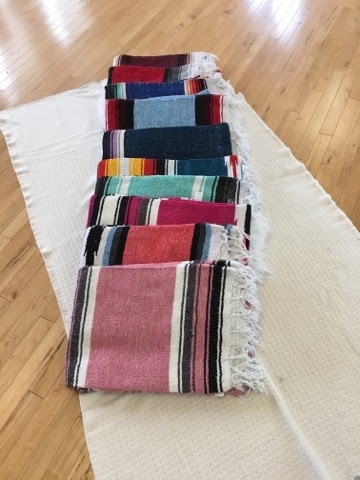 Each blanket is unique and varies in color of diamond, cotton content (10% plus), and size (at least 78" X 54"). Color selection changes daily so the colors may vary from picture. We recommend either hand washing in cold water or if machine-washing use on a gentle setting with a mild detergent. Do not use bleach. To dry your Cotton Yoga Blanket, air-drying or hang drying is the safest way. Dry cleaning your blanket is also an option.